Recently subjects of cartographic activity began to express special interest to the issues of protection of intellectual property rights by reason of numerous cases of occurrence of popular products in the national market produced without any permission documents from the producer on the basis of the product with the rights to the product belonging to another institution. 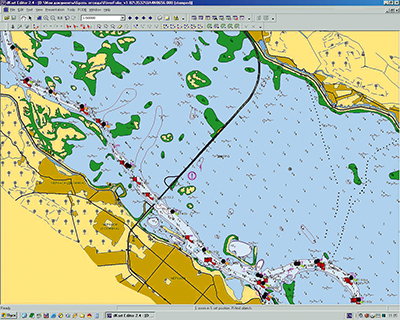 Thus, in 2008 while monitoring of navigational charts market there were found electronic charts of basins of the Dnipro River and the Danube River which were an electronic copy of navigational river charts developed and issued by the State Hydrographic Service of the Ministry of Infrastructure of Ukraine. It was indicated on the charts that they were developed by Aeroscan LLC. Aeroscan is an official dealer of Garmin Ltd. in Ukraine. It was this company which distributed the above-mentioned electronic charts by means of sale of GPS-navigators of this and other companies into set of which the Dnipro and Danube electronic charts were included. Comparison of the charts of Aeroscan LLC and those of the State Hydrographic Service of Ukraine has shown their partial equivalence: unique elements of the cartographic product coincide, positions of shore lines as well as navigational equipment and its condition and availability, selection of depths, their position and values, depth contours positions and configuration, dangers position etc. repeat. Aeroscan LLC hasn't provided us any convincing explanations to our inquiries concerning the nature of such charts occurrence therefore we had to apply to the Economic Court of Kyiv City with a claim for restoration of the violated rights. The trial lasted almost for five years and a half. For this time State Hydrographic Service of Ukraine and its Branch 'Ukrmorcartographia' have prepared numerous service documents for the court trials; a number of inquiries have been sent to the State Service of Geodesy, Cartography and Cadastre, Ministry of Justice of Ukraine, State Border Service of Ukraine and state specialized research institutions have conducted two forensic examinations of intellectual property rights. Replies from all the mentioned institutions as well as conclusions of repeated forensic examination of the Research Centre of Forensic on Intellectual Property of the Ministry of Justice of Ukraine have confirmed the validity of our claims regarding unauthorized use of the cartographic product of the State Hydrographic Service of Ukraine by Aeroscan LLC. And finally the justice has been restored! On August 18, 2014 the Economic Court of Kyiv City passed the judgment according to which Aeroscan LLC is prohibited any use by reproduction with violation of copyright (including cartographic products adapted for navigators) for chart products exclusive property copyrights for which are owned by the State Hydrographic Service of Ukraine; Aeroscan LLC is also forbidden to carry out any actions on production, sale, transfer to the use of cartographic products for production of which cartographic products of the State Hydrographic Service of Ukraine were used. The advice to everybody is the following: when you face with injustice, fight and you will win.